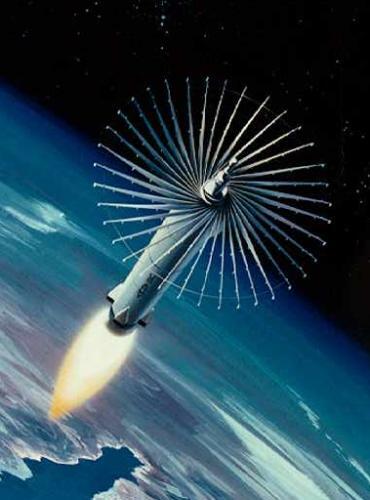 The first program, which actually tested a hit-to-kill missile interceptor, was the Army's HOE (Homing Overlay Experiment). The HOE vehicle consisted of the first two stages (Thiokol M55E1 + Aerojet General M56A1) of a LGM-30A/B Minuteman I ICBM, which boosted a large KKV (Kinetic Kill Vehicle) to high altitude. The KKV was equipped with an infrared seeker, guidance electronics and a propulsion system. Once in space, the KKV could extend a folded structure similar to an umbrella skeleton of 4 m (13 ft) diameter to enhance its effective cross section. This device, which also had weights attached to the ribs, would destroy the ICBM reentry vehicle on collision. A total of four intercepts were attempted in the HOE test program. In each test, a Minuteman ICBM with a dummy warhead served as the target. The first attempt on 7 February 1983 missed because a failure in the IR sensor prevented proper target tracking. The next two flights in May and December 1983 failed, too, because of malfunctions in the guidance system. However, the fourth and final test on 10 June 1984 was successful, intercepting the Minuteman RV with a closing speed of about 6.1 km/s (20000 fps) at an altitude of more than 160 km (100 miles).